In this post, I am providing a progress status on the development of DayTickler. For more than seven months, with my business partner Erik Renaud, we are currently building the first version of DayTickler, a mobile app to plan your “Today Schedule”. It’s going well. By the end of August, we will have a Minimum Viable Product (MVP) ready for launch in the app store. 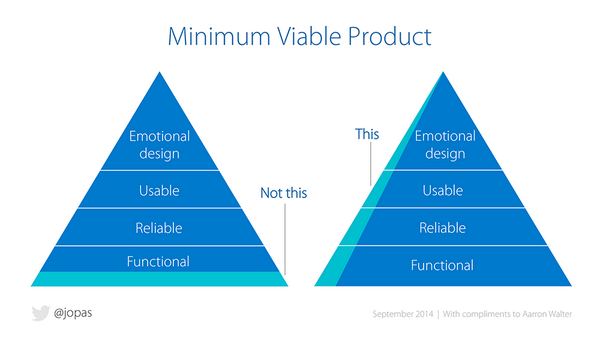 The process may seem long but we must ensure that our first version will be a minimum lovable product. As noted on twitter by Jussi Pasanen, building a MVP is much more complex than programming a few scattered features. This is a wise mix of a functional, reliable, usable and emotional design. Categories: Lean Startup | Tags: MVP | Permalink.